With the news surfacing that Jay Turner will enter his supercharged Nitro Harley “Lucky 7” in the season-opening NHRA Winternationals from Pomona, Calif. Feb. 8-10, Cycledrag.com checked in with fellow supercharged racer Takeshi Shigematsu to see if there would be two blown bikes at the Fairplex. Shigematsu says his team plans to make its season debut at the NHRA Gatornationals in Gainesville, Fla. March 15-17. “Crazy Tak”, known for his fearless riding, is the pick of many to become the first Harley racer to run a five-second elapsed-time. 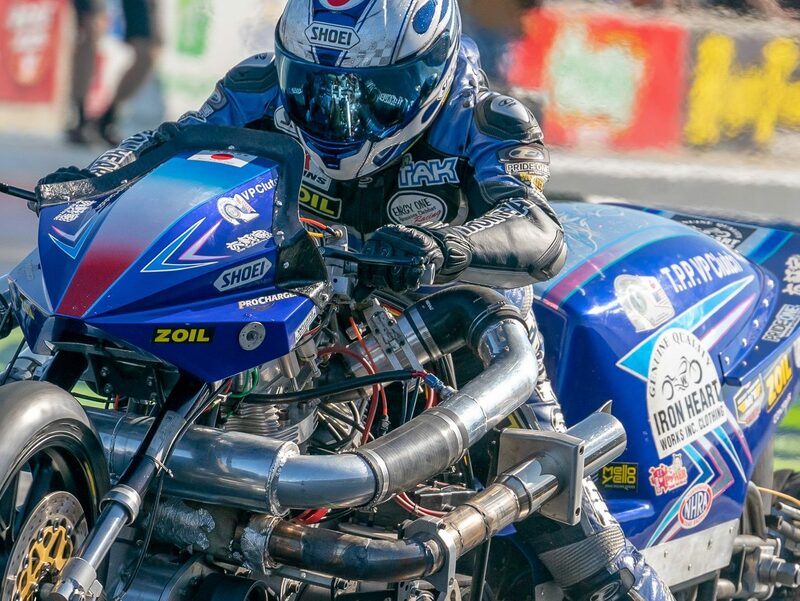 Shigematsu, aboard his Don Johnson-tuned, Pro Charger Harley, recorded a jaw-dropping 6.02 at the Man Cup Finals at South Georgia Motorsports Park in November of 2017. The pass was far from flawless as Shigematsu broke his handlebars and brushed the wall. Shigematsu and team them made the long trip to Calif. to enter the 2018 NHRA opener in Pomona and suffered a miserable weekend. The team was hampered by a mysterious mechanical problem and was unable to make a clean pass down the track. Shigematsu returned to form this past November at the Man Cup Finals where he defeated reigning NHRA Champion Tii Tharpe in the semifinals with a stellar 6.06. Tak told Cycledrag.com being the first to reach the Harley five means a lot to him. Many are still picking Shigematsu to be the first to run in the fives, but has the “Man from Japan” now left the door open for Turner to take home the lifelong bragging right? If Shigematsu’s travel plans remain the same, Turner will have two races, Pomona and Phoenix, to attempt to accomplish the feat before Shigematsu joins the tour in Gainesville. Will the first Harley five happen this year? Who is your pick to do it? Feb. 7-10, Lucas Oil NHRA Winternationals, Pomona, Calif.
March 14-17, Amalie Motor Oil NHRA Gatornationals, Gainesville, Fla.
June 7-9, Menards NHRA Heartland Nationals, Topeka, Kan.
June 14-16, Fitzgerald NHRA Thunder Valley Nationals, Bristol, Tenn.
July 5-7, NHRA New England Nationals, Epping, N.H.
Aug. 15-18, Lucas Oil NHRA Nationals, Brainerd, Minn.